Aircast Univ. Quick Fit Shoulder Immob. Aircast Quick Fit Shoulder Immobiliser by DJO Canada is designed for shoulder protection post-trauma. Cushion-like material helps in preventing internal rotation contractures. 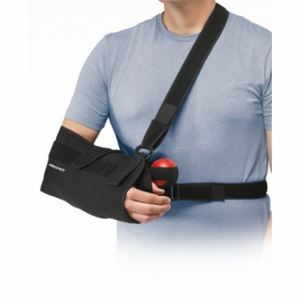 Mesh like material of Arm sling allows proper airflow quickening up the healing process. Shoulder straps and cushioned waist gives superior comfort to patients. Can be ordered with pillow or without pillow. The maximum length of the sling would be 17".